I’ve been wanting to see “The Woods” for quite awhile now. I’m a big fan of Director Lucky McKee’s previous film “May”, an excellent psychological horror film. “The Woods” had a difficult time getting released in the first place. 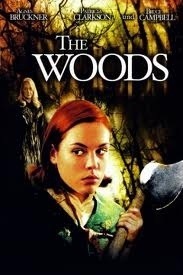 It sat on the shelf for 3 years and was originally set to come out before 2004’s “The Village”, which had originally been titled “The Woods”. Sitting on the shelf for 3 years rarely bodes well for a film, and I’d heard mixed things, causing me to avoid it for several years. 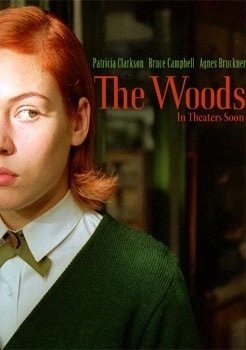 “The Woods” is set in 1965 and is about a delinquent girl who is sent to a remote private school for girls (filmed in Montreal) after she sets a severe fire. 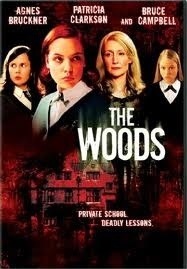 She begins to suspect the school is run by a coven of witches, and that the woods themselves are haunted. The cast is generally excellent, including a solid dramatic turn from “Intruder”s Bruce Campbell. McKee has a talent for finding solid unknown leading ladies in his films and this is no exception. Agnes Bruckner does a good job as sassy miscreant Heather. Veteran actress Patricia Clarkson (Shutter Island, The Green Mile) also impresses as the sinister headmistress of the school. “The Woods” does a good job setting an uneasy tone early. It really drew me in with the spooky location, solid cast and quality directing. That said, it’s not all gravy. I’ll confess, I’m not much for Witch movies by and large. While I wouldn’t say all Witch movies are bad, I’ve just personally never been big into demonic or witch-type movies. In this case, it wasn’t the witches that were the problem for me. In fact, this has a good story and is actually a pretty good flick until about the last 20-30 minutes. It’s not “bad” necessarily, but once a bunch of computer generated tree branches hold back the schoolgirls so that they can be possessed, it kind of takes you out of the film a bit. I certainly understand where they were trying to go with it, and maybe my expectations were a bit high based on “May” and the amount of time it took me to see it. That said, it just kind of fell apart at the end. I think McKee did a good job directing, but maybe next time he should write it himself. Still, if you haven’t seen “May” (or its companion film starring McKee, “Roman”) I highly recommend it ! This entry was posted in Reviews and tagged 1965, 2012, Bruce, campbell, coven, cult, friendo, Halloween, Horror, lucky, May, October, review, Scary, schoolgirl, terror, thriller, village, witch, woods by lazron. Bookmark the permalink.